I have this problem. I seem to make things more complicated than they need to be. Sometimes it’s because I have too much knowledge and sometimes it’s because I don’t have enough knowledge. In both instances I leave the person I’m communicating with confused. This is a good question for you, “how often do we over-communicate with others?” This question is best asked to professionals that provide advice to others. We’ve spent years learning our craft. We have a great deal of knowledge and often we want to “dump” that knowledge on our clients. We do this for a variety of reasons. Sometimes we want to show how smart we are. Some advisors think their clients really need all of the information they provide. Some advisors don’t think their clients will value them unless they show how smart they are. Some advisors don’t know what they’re talking about and use jargon to confuse their clients. It doesn’t really matter what the reason is, it’s your responsibility to make sure you communicate in a way your clients can understand. You don’t care how smart we are, you don’t care how long we’ve worked learning our craft, and you certainly don’t want to be duped. What you do care about is how clear and understandable our ideas are. You want to know what your advisors can provide for results. It’s never about how much you as an advisor know, it’s what happens when your ideas are applied. 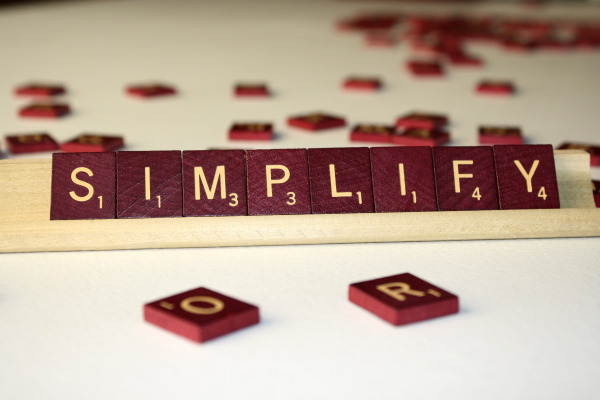 I’ve come to understand that simple is always better than complicated. If we can’t explain what we’re trying to do in 500 words or less we either don’t understand it ourselves or haven’t thought thoroughly enough about the solution to provide an understandable explanation. Even better yet, take the time to learn how to mind map and develop complicated ideas through the use of mind maps. I’ve been using mind maps with clients and find that really complicated ideas I’ve been having a hard time communicating become understandable. Laying out a complex idea using visuals and connections between parts of a plan allow a business owner to not only understand what I’m proposing but also plan for implementation of the idea. One of my favorite sayings is, “the meaning of your communication is the way it’s heard.” It doesn’t matter what I say or what I write. It only matters how the information I’m communicating is heard and understood. If I haven’t communicated simply and clearly, then I haven’t done my job. It doesn’t matter how much I know. It only matters how I can communicate what I know and how that knowledge translates to making my clients lives better. What about you? Do you communicate with others in an easy and straightforward manner? We’ve put together a special report and mind map on our Objective Review process. You can download this report and see how we’ve taken a long report and simplified it through the use of a one page mind map. To get this report, click on the button below.